Mamata Banerjee yesterday announced the formation of an umbrella organisation by merging the four Trinamul tea trade unions in north Bengal. 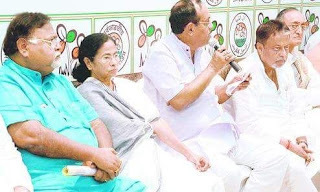 At a meeting of Trinamul's policy-making body in her Kalighat home, the chief minister said a "federation" would be formed to streamline Trinamul's tea union politics. Ruling party sources said the main objective of the move was to strengthen Trinamul in the Darjeeling, Jalpaiguri, Cooch Behar and Alipurduar tea belt. Mamata said PWD and youth affairs minister Aroop Biswas, Trinamul's observer for north Bengal, and power minister Sobhandeb Chatterjee, a veteran trade union leader, would oversee the formation of the federation. Chatterjee will helm the federation, the chief minister said. tea garden residents play a decisive role in elections. In the Assembly elections, Trinamul won 11 of the 18 seats, the Left-Congress alliance three, the Gorkha Janmukti Morcha three and the BJP one. Although this was Trinamul's best-ever performance in the region, the party's trade unions in the tea gardens are weaker than those of the CPM and the Morcha. At today's meeting, Mamata instructed senior INTTUC leaders to ensure the formation of the federation by August 10 so that a convention could be held at Netaji Indoor Stadium on August 20. "We have been doing some work, politically, in the tea belt. But that will not suffice. We have to go from strength to strength there. I want to see the federation formed within the deadline so that the convention is a success. That will be our stepping stone to a much better presence in this crucial area," the chief minister was quoted as saying. The results of the Assembly elections showed that the BJP was making inroads into the tea belt. Residents of the seven Duncans gardens in the Dooars, whose management-control the Centre ordered the tea board to take up, had voted overwhelmingly for the BJP. "Didi feels we do not have an adequate trade union base in the tea belt. There are some organisational weaknesses that are deterring us from reaching out to each and every worker and family in the gardens," a minister said.